Compared to lead-acid batteries, RELiON’s lithium iron phosphate (LiFePO4) batteries offer users practical advantages such as lighter weight and hands-off operation. These batteries also have longer lifetimes which makes for far less frequent battery replacements and service calls. But many first-time buyers of LiFePO4 batteries wonder if their higher purchase price compared to lead-acid batteries makes sense in terms of total cost of ownership. Do LiFePO4 batteries cost more, or less, than lead-acid batteries over their operation lifetime? In this article, we present the results of a simple calculation that compares the total cost of ownership of a LiFePO4 battery compared to three competing lead-acid technologies. Along with the initial cost of the battery, perhaps the most critical factor in estimating the total cost of ownership is the specified lifetime of the battery in terms of the number of cycles until end of life. For our calculations, we took end of life to be when each battery fails to deliver 50% of its initial capacity for lead-acid batteries and 70% for LiFePO4 batteries. The table below shows the retail price and expected number of cycles until end of life, taken from retail websites and the manufacturer’s published data sheets, of the four batteries used in this analysis. 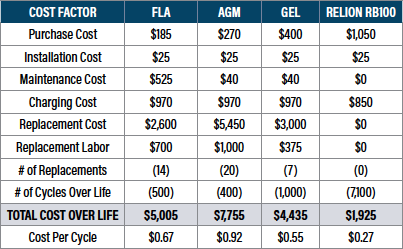 The table below shows each factor in the overall total cost of ownership for each battery as well as the total cost of each battery per cycle. Based on the specified lifetime of each battery and their retail prices, it’s clear the total cost of the RELiON RB100 battery is far less in terms of each cycle and in terms of the overall cost of ownership. RELiON’s long-lived LiFePO4 batteries reduce the inconvenience and expense of replacement and service calls, and they lend peace of mind to many users when it comes to demanding applications. As this article shows, LiFePO4 batteries are also beneficial to the bottom line. 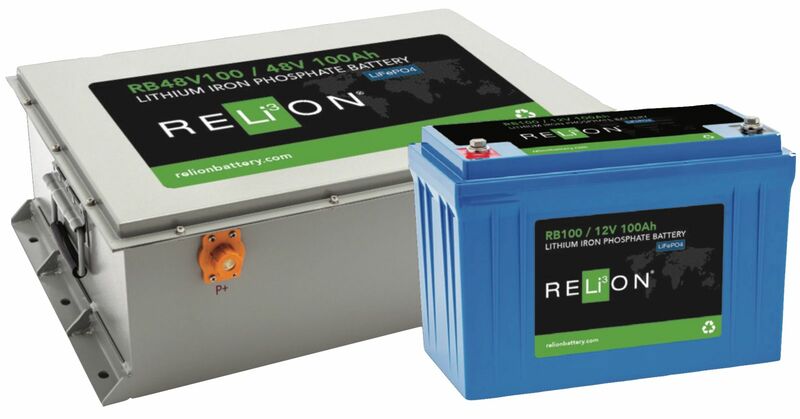 Our calculation compares the total cost of ownership of RELiON’s RB100, a 12V 100 Ah LiFePO4 battery, to three equivalent size (BCI Group 31) off-the-shelf lead-acid battery technologies. Using measured lifetimes taken from the manufacturer’s published specifications of each battery, our analysis shows that the RB100 costs at least 51% less over life than even the most cost-effective lead-acid battery. Find out how you can take advantage of RELiON lithium batteries on your Catamaran. Best of all, Just Catamarans can assist with installation and offers an extended warranty when purchased through us.